The date on the headstone should be 1916. Vicki has sent me some photos and some information about her great grandfather William Francis. 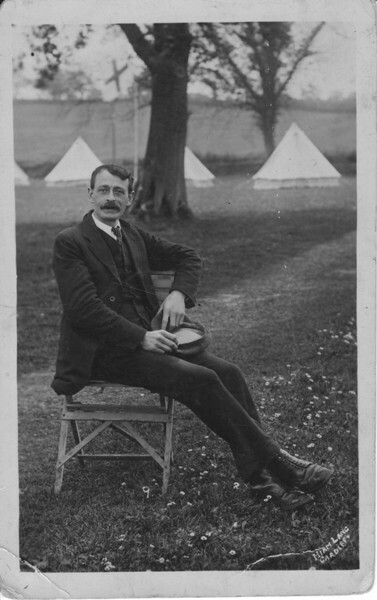 The first one is of him in Sophia Gardens, Cardiff getting ready for the Boer War. The second is of him in Diss Norfolk, 1st Welsh Horse Regiment some years later. The other maybe a memorial service? In Cardiff for him. He was married to Edith Margaret. Please get in touch if you have any more details about William. Jonathan was in the 6th Battalion Yorkshire Regiment. He was born in Stockton-on-Tees and enlisted in Hartlepool. Wilfred John Son of Harry Lynes Carpenter, and Sarah Jane Carpenter, of Great Rollright, Chipping Norton, Oxon. There is an entry for Emily CARROLL. Wife of Henry who is in the same grave. She is burial record no. 2013 who died on 4th January 1954 in Ivy Dene Nursing Home, York. Son of Richard and Mary Carroll; husband of Emily Carroll, of Cashel, Fleet, Hants. There is a marriage Index for Henry Arthur Carroll and Emily Deane in july/august/september 1899 in Fermoy Ireland. Son of John and Ella Emma Casson. Served in the Burma War and in the South African Campaign with Royal Field Artillery. Born at Woolwich, London. Nora was the daughter of John and Hannah Caveney of Yorkshire. She was the first member of the ATS to be killed by enemy action. See article below from The Argus from the National Library of Australia. Nora is remembered on the Todmorden War Memorial. This is a photo of Gil Francis who very kindly met my friend Paul and I in November 2013. He was an apprentice bricklayer in WWII and erected Nora Caveney's headstone and a few others. He told us how the hole was dug and then kept open with 2 wooden supports whilst concrete was poured inbetween and the headstone was straightened and levelled. He has a lot of memories about Netley and was a joy to talk to. On Wednesday 12th October 2016, a plaque was unveiled to remember Nora, the people and the buildings that made up the Westwood Royal Artillery Camp in Westwood. Ernest Son of Charles and Louisa Chaff; husband of May Clara Chaff, of 115, High St., Croydon. Born at Croydon. 10317 Henry CHALKLEY 1STRoyal Irish Rifles died July 24th 1916 age 18. Catherine Rogers sent me an email after reading my appeal for stories in the Echo newspaper. Henry (or David which is the name he enlisted under in 1914) was injured on the first day of the battle of the Somme. He was wounded in the abdomen and was sent back to the University War Hospital in Southampton where he passed away on 24th July 1916. Catherine’s great grandparents visited him there and spoke very highly of the staff there. Catherine goes on to say that her great grandmother Annie never forgave her great grandfather for letting Henry go to war.She sent me a copy of a photo of Henry in his uniform. My thanks to Catherine for this information. Oxford & Bucks Light Inf. Son of Mr. and Mrs. Charlton, of 65, Prospect St., Reading. Born at Emmer Green, Reading. Harry George CHATFIELD was born at Haywards Heath and joined the East Sussex Constabulary on 9th May 1911 age 27, warrant card number 1260. He resigned on 1st September 1914 to rejoin the Colours and enlisted at Cuckfield giving his residence as Haywards Heath. Son of Henry and Frances Chatfield of 4, Mill Green Road, Haywards Heath, Sussex. Husband of Margaret Chatfield of The Vineries, Langney, Eastbourne, Sussex. John was born in Norfolk. His effects were left to his brother William. Theodore Mark CHURCH, son of Mark "Augustus" CHURCH (1844?-1893) and Susannah Louisa FLOWERS (1855- 1926), was born on 1 October 1886 in Brisbane Queensland. He emigrated from Sydney, Australia to London in December 1899. He appeared in the census on 31 March 1901 in Putney aged 14. 1 He appeared in the census on 2 April 1911 in Military - Burma and Andaman Islands aged 24. 2 On 2 April 1911 he was a Private, Easr Surrey Regiment in Military - Burma and Andaman Islands.2 In 1915 he was a SPR, Corps of Royal Engineers (Kitcheners Army). He died on 2 April 1915 in Netley Hospital, Southampton. He was buried in Netley, Southampton. "According to Soldiers who Died in the Great War, Theodore enlisted in Jersey with the East Surrey Regiment, this possibly taking place at some point between 24th October, 1905 and 5th November, 1908, when the Regiment’s 1st Battalion garrisoned Jersey. His regimental number purported to be 8718, although there is another soldier listed with that number. He later served as a Sapper (regimental number 30832) with the Reserve Signal Depot, Royal Engineers and died at Netley Hospital, Southampton, Hampshire, England on 2nd April, 1915. Theodore was the older brother of Chester Cecil Church, and his parents were Augustus Mark Church and Susannah Louisa Church (née Flowers). Susannah was widowed in 1893, and married Frederick George Aplin two years later. The Aplins, along with Theodore and Chester, lived in Jersey for a period between 1902 and 1910, at the Grasshopper Hotel at 3 Mulcaster Street where Frederick was the Manager, working for Susannah’s younger sister, Caroline Flowers". The above information was kindly sent to me by from Andrew Weller after I contacted him on Ancestry. Sadly when I visited the cemetery before Christmas 2013, Theo's headstone had broken in half again and this is all that is left now. Whilst being invalided home from the Dardanelles, Private Joseph Claffey, 2nd. Battalion, South Wales Borderers, son of ex-Colour Sergeant Claffey, Mill Place, Welshpool, died from malaria. The news is doubly-sad in view of the fact that Private Claffey had distinguished himself during the operations on the Gallipoli Peninsular and on Saturday week, several weeks after his death, his name appeared in the list of those specially mentioned by Sir Ian Hamilton for distinguished service. He died during the third week in October on board an Italian hospital ship sixteen hours before reaching land. It is stated that the fever brought on heart failure which was the actual cause of death. * He was buried in the soldiers’ cemetery at Netley Hospital and his burial was carried out with full military honours. The coffin was conveyed on a gun-carriage and on it was laid the Union Jack and four sheaths of white flowers. 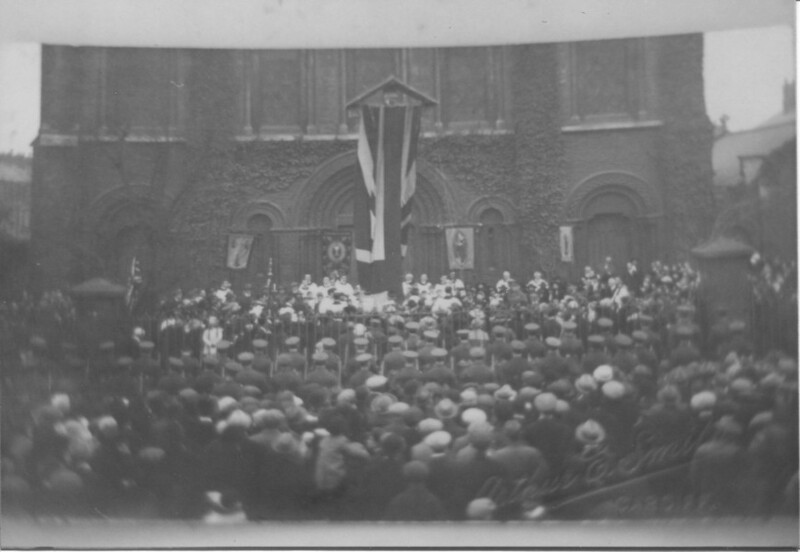 A number of RAMC men walked in the procession. Writing to Private Claffey’s wife, the sister in charge of the ward in which he died states that "He was fairly well and able to talk until the day before he died. We all expected he would reach home safely but he was suddenly taken very much worse. He was a general favourite on board. He was so patient and always tried to make the best of things. We all felt it very much when he died." Private Claffey had served in the army for fifteen years. He joined at the time of the South African War and served with the Second Battalion, South Wales Borderers, in that campaign. He served in South Africa for some years after the conclusion of hostilities on garrison duty at Pretoria and was awarded the Queen’s and King’s Medal. When the regiment was on furlough, he married. 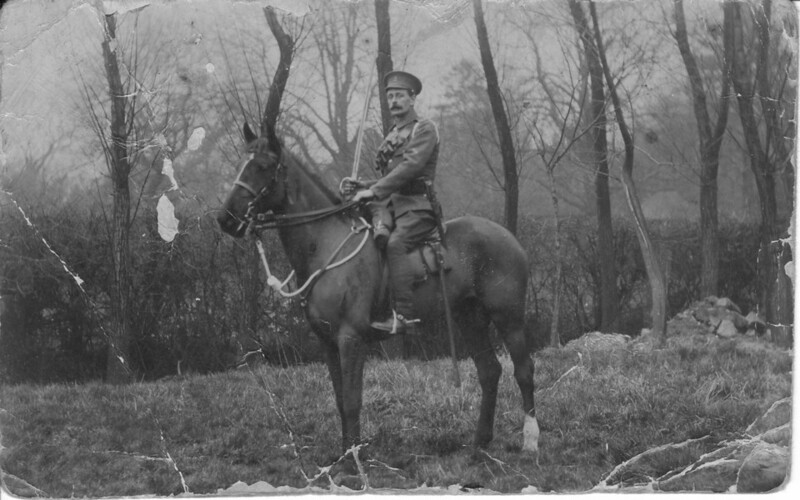 In the present war, he participated with his regiment in the taking of the German stronghold in China, Tsing Tao, and subsequently on the Gallipoli Peninsular where the Borderers upheld the reputation of the regiment in a particularly gallant manner. Private Claffey was in the thick of the fighting when he was attacked by malaria fever. He leaves a widow and one child. Joseph is remembered on the Welshpool War Memorial as receiving the D.C.M. but no record can be found of this. My thanks to Richard for this information. Burial record states that he died in the Isolation Hospital at Netley aged 38. William Henry was a Bandsman at the time of enlisting. His effects were left to his father William Henry. Burial record states that Charles died in the University War Hospital Southampton aged 37. Son of Mr. G. Clifford, of 83, Kingshill Rd., Swindon. Edwin Victor Son of George and Mary Ann Coates, of 6, Nicholas St., Chapel Field Rd., Norwich. Edward James Son of Edward and Mary Woods Coleman; husband of Alice Maud Coleman, of 12, Park Rd., Tunbridge Wells. Frederick George Son of William John and Emma Jane Coles, of 30, Lower St., Dartmouth. Frederick George Coles was my husband's Uncle. He was born on 13.12.1886 and fought in WW1. He was wounded and taken to Netley hospital where he died from gunshot wounds. That information was given to me by his sister, my mother-in-law before she died. 30 Lower St. Dartmouth. C.E. 1880.
brother-in-law. Frederick was one of 14 children, 11 boys and 3 girls, born to William and Emma. Another of those brothers was killed in the trenches in 1917. Bertie James Coles is buried in Ecoust Military Cemetery Ecoust-St. Mein France. All other brothers survived the war. it when I get further details. Thank you very much Jennifer. Stanley Charles Son of Captain Collins. Born in Guernsey. Daniel Patrick Husband of Elizabeth Smith (formerly Comby), of 17, Talbot Grove, North Kensington, London.